Looking for a quick stocking stuffer idea? Know people who really love coffee? 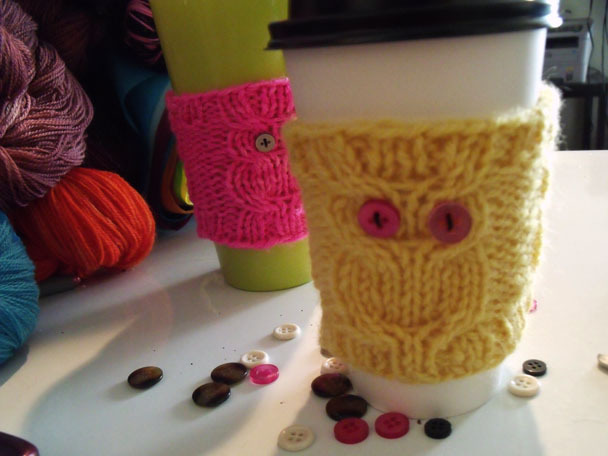 This knit coffee cozies are quick and cute. I love home made coffee cozies. 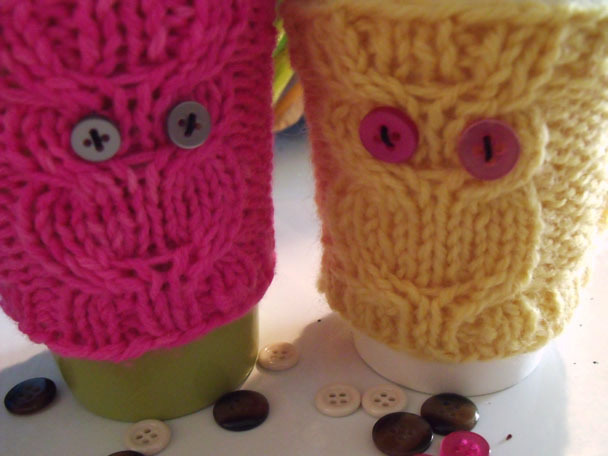 These cozies are insulating, cute, and reusable. 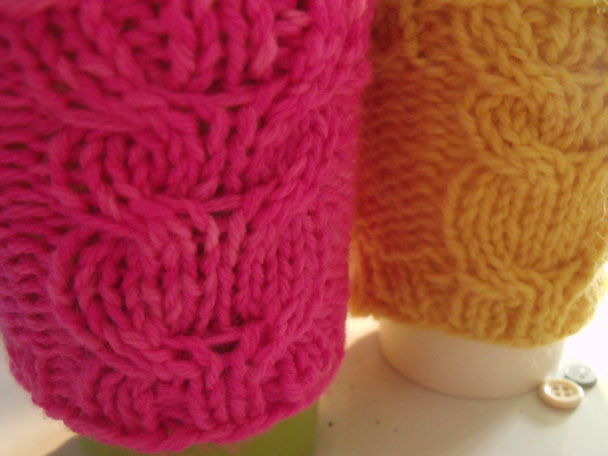 They are also a great way to use up left over yarn, taking only about 50 yards to complete each one. You can use as is, or for more fun, sew six small buttons on for eyes. These are darling,,,, will whip some up this weekend!!!!!!!!!!!!! I’d like to teach this as a class at a LYS I work at. Would you be ok with that? We’d give all the credit and include the webadress for your blog. As long as credit is given, that is find with me. Hi Marla, if i do this on circular needles, am I supposed to join in the 1st round? Is it possible to use circular needles in this project instead of DPNs? Yes, you could use Magic Loop or two small circular needles instead if that’s what you prefer. So adorable! I am making these as a “Pay It Forward” project on Facebook. I’m making them, postinga pic of the finished Owl Cozy on FB and just giving them away to the very first person who says they want it. I mail it to them for free. My only two requests are that they pay the kindness forward (can be any kindness…doesn’t have to be something hand made) and that if they already got one, that they don’t request any more. Give other people a chance, and allow me to spread the kindness that much further. These little owl cozies are a perfect project for something like this. Amd it uses up my left over balls of yarn!!!! Thank you for sharing this pattern! Hi there! I absolutely LOVE these! And have made many as gifts for friends and family!!! Just wanted to check with you that it’d be okay that I sell the cozies at a local craft sale? Thanks! Yes, that’s perfectly, fine. Please just direct folks my way when they ask. Good luck! Love this pattern! Very clear instructions, it was fun to make and everyone who sees it loves it! thank you for this pattern and making it free. i started out trying to make a hat and my owl looked like he had a broken leg. i used your pattern to practice and get it right. now to conquer everything owl! Trish, I’m so glad you found it helpful! Seriously LOVE these! Made two this week. Modified a bit, but super fast and cute. Thank you! Going to give some to teachers I think. It is a satisfyingly quick knit. I’m glad you had fun with it! Anyone try this with straight needles then seemed? No one has reported back that they’ve tried knitting flat and then seaming, but I dont see why it couldn’t be done as long as you make sure the edges are between the owl motifs and make the proper modifications on the WS rows.